Our rolling house IS a very, very, very fine house (a gift from Janie). And the owl, crafted from an A&W Root Beer can, is a gift from our son, Nate, to remind me of my first job, the beginning of it all! Tom and Judy dolls re-created by Judy's sister, Nancy, complete with miniature work badges. Our zero-gravity camp chairs and REI camp table, essentials that collapse and store under the back of the bed. A traveling couple, a vintage tea towel from Tom's sister, Ronda. It hangs in the kitchen. Dishtowels and hot pads sewn by Nancy. A mind-blowing tri-domino game handmade from wood, a gift from our friend, Tami. Tom riding the folding Brompton bicycle through the beach grasses in Long Beach, Washington. Our bedding, queen quilts and sheets sewing in half and velcroed together, opening toward the center aisle. Stuff seems to be the big issue for people. It was for us when we lived in a big house. We filled it with stuff. When we decided to sell the house and live on the road, we got rid of about 60 percent of our stuff. The rest, antiques, family photos, boxes of vintage Christmas decorations that can’t be replaced, that beautiful glass-front bookcase we waited years to buy, that stuff is in storage for the day we decide to stop rolling, whenever that may be. In fact, Tom and I figure that, if we had it to do again, we would get rid of half of what’s in storage. We haven’t missed any of it in the more than a year since we left. Our bed and dresser now sit in my mother’s guest room, where we stay when we go home for Thanksgiving and Christmas. But what did we take? What’s in The Epic Van? What makes it a home? What was a mistake and what was sent packing? The laundromat in Del Rio, Texas, was the lone business in a shuttered shopping strip, miles from downtown. The good news: It was open until 11 p.m. Little did I know I would meet my doppelganger there. Eggs stay safe in a plastic camping case. Puzzle skills help in packing everything onto the shelves. Beer, the top priority, takes up about a third of the refrigerator capacity. When Judy and I began shopping for a Class B RV, we quickly decided that openness in our “house” was more important than the capacity of our refrigerator. We chose the Roadtrek RS Adventurous, with nearly 360-degree windows. There was another model, the CS Adventurous, that had a much larger refrigerator that stood all the way to the roof, but it eliminated some windows. We opted for light. Six months of full-time living in The Epic Van, and our choice has been validated. The day I bear-sprayed myself started out fairly organized. We were planning to leave early from Bog Springs Campground in Madera Canyon, a beautiful spot in the Coronado National Forest in Arizona. We wanted to get to the Titan Missile Museum on our way to a campground near Arivaca. We were up early, stowing our bedding, making breakfast and packing up all our gear, camera, hiking boots, camp chairs, grill, computers, knitting, cat. 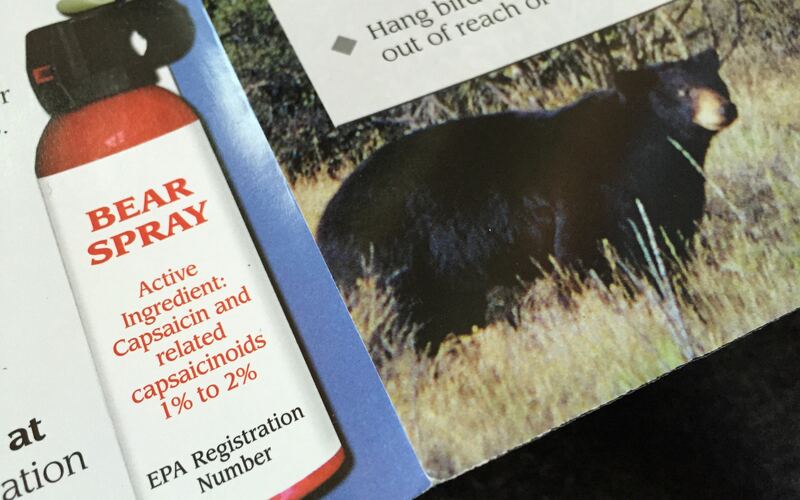 I wasn’t even thinking about the bear spray.